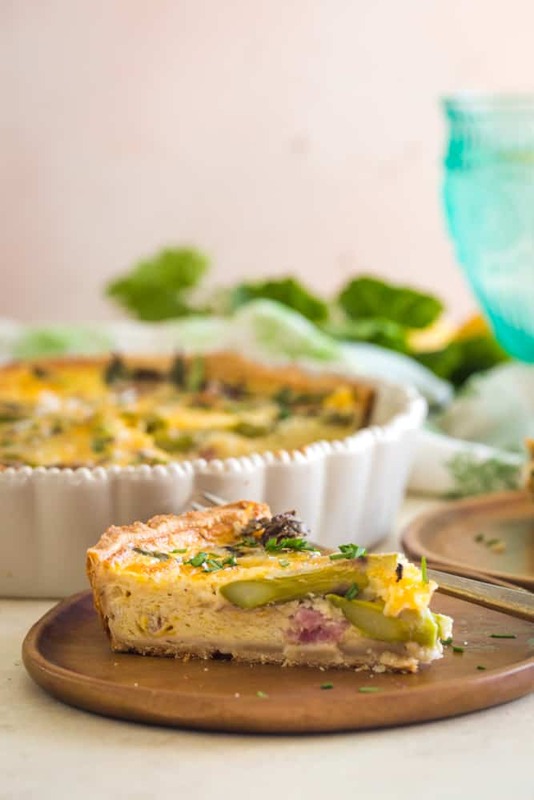 Perfect for serving at your Easter brunch, this recipe for Asparagus Ham Quiche is a truly delicious way to welcome spring. Asparagus is at its peak during the spring, making it the ideal springtime ingredient for all sorts of dishes. 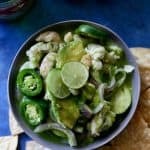 I love to add it to salads, blend it into soup, and serve it on the side with a wide variety of main dishes. 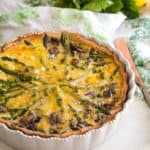 But my favorite way to enjoy the springtime flavor of asparagus is when I make quiche. 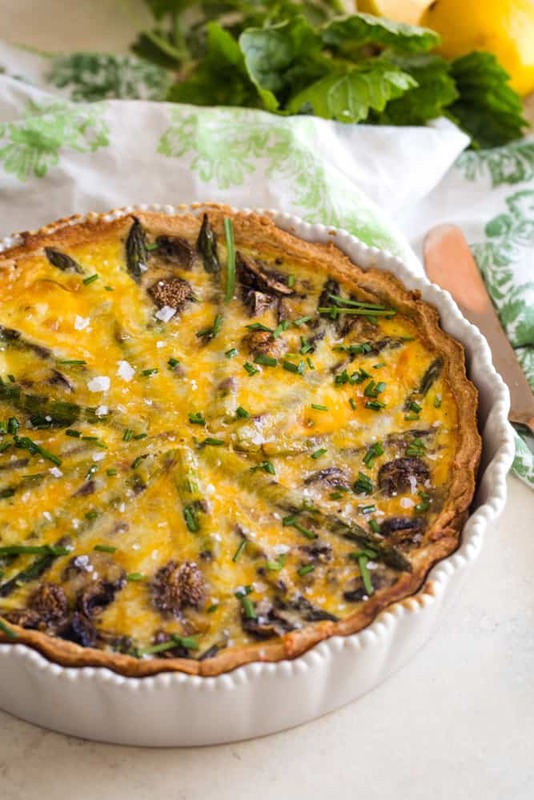 Quiche is one of the most versatile dishes around. It somehow manages to be both light and delicate, yet hearty and satisfying. 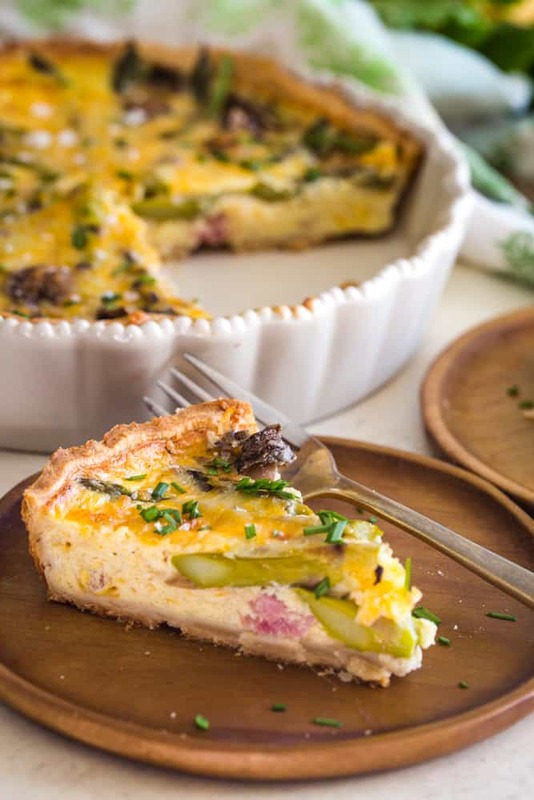 While it is synonymous with brunch, quiche is a great all-around dish that can be served for breakfast, lunch and dinner. And this version, featuring the classic flavor combination of ham and cheese, is a favorite in my house. 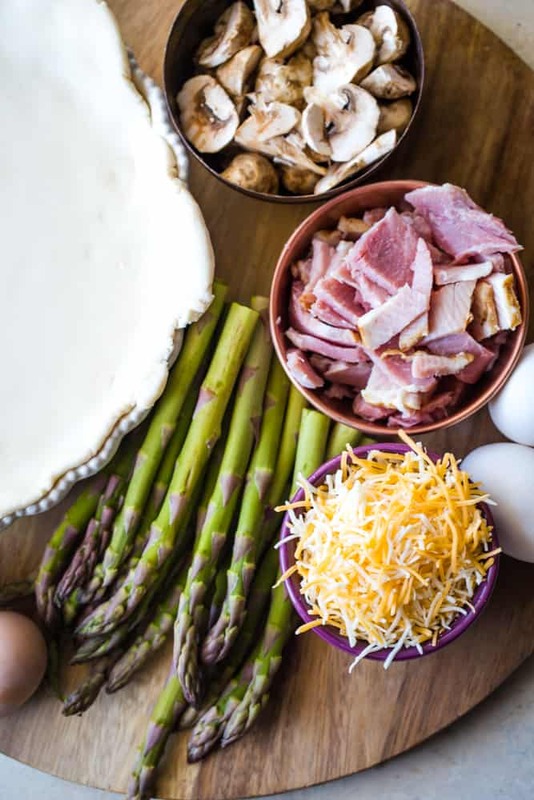 Asparagus Ham Quiche is also a fantastic meal prep solution. You can assemble it ahead of time and store in the fridge until you’re ready to bake. 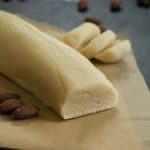 Or you can bake it and then store in the fridge for a week, or in the freezer (wrapped tightly with plastic wrap and then aluminum foil) for up to 3 months. 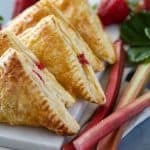 So handy to have on hand for last-minute entertaining or on hectic weeknights. 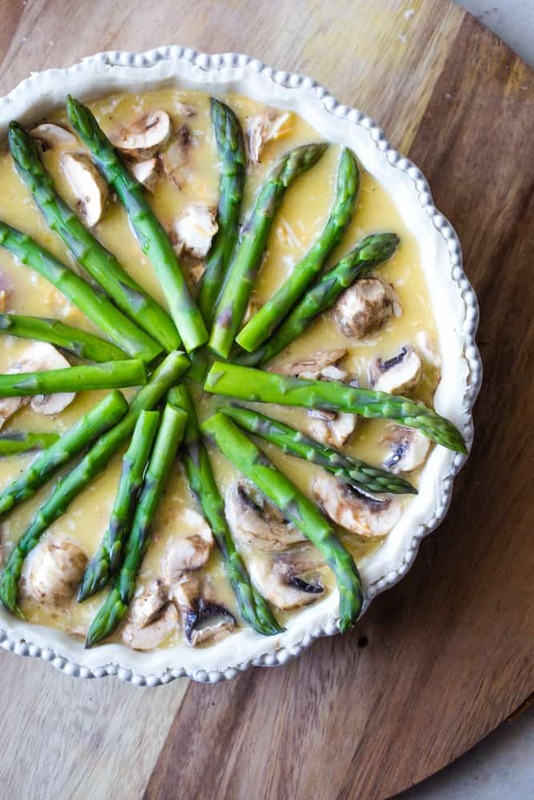 Looking for more ways to enjoy asparagus? This recipe for the Perfect Hollandaise Sauce is an ideal accompaniment. And if you’re in the mood for more savory egg dishes, check out my Chorizo Egg Muffins. 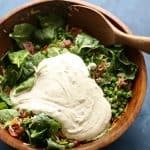 And this Bacon Pea Salad is full of delightful savory springtime flavors. Not only is this quiche pretty to serve, but it also tastes delicious. Trim the bottom of the asparagus making the stalks about 4 1/2 inches long. Cook for about 5 minutes in a pot of boiling water then rinse with cold water. Set aside. Preheat oven to 375 degrees. Lightly spray 9 inch pie plate with non stick cooking spray. Place pie plate on a foil lined cookie sheet. Unroll the pie crust and press into prepared pie plate and crimp the edges, if desired. 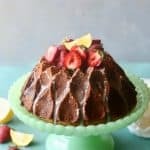 In a large bowl, whisk together eggs, cream, and spices. 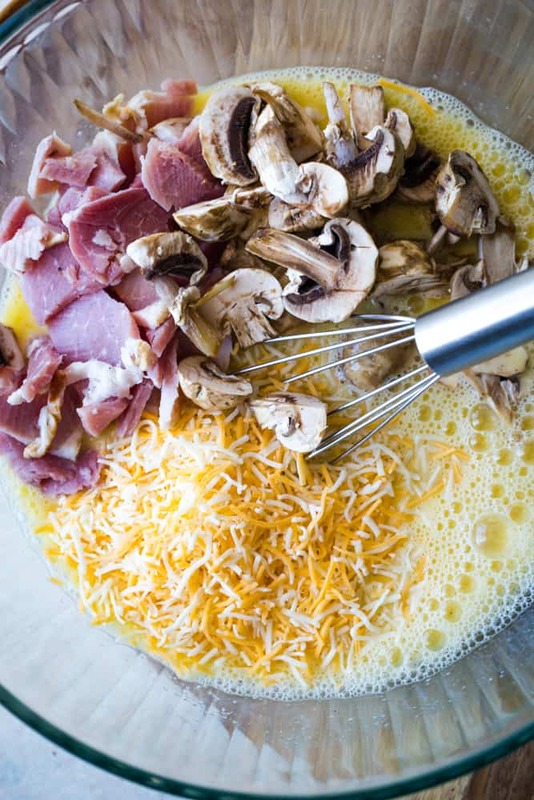 Whisk in mushrooms, ham, and 1 cup shredded cheese. Pour mixture into the unbaked crust and spread filling around, if necessary. Arrange the asparagus spears around the filling. Lightly cover quiche with foil and bake for 25 minutes. Remove foil and bake uncovered for an addition 10-15 minutes or until golden and the center is no longer jiggly.